The Mother of All Treasure Tables put the "Ah!" (or awe) back into your treasures! From the farthest corners of the earth, a vast array of treasure has been gathered. Never before has such a book been available, to provide with a simple roll of the dice a random selection of detailed descriptions - treasures that include weapons and walking sticks, elaborate jewelry and wooden buttons, carved boxes with secret compartments, rare ivory and iron pots. There are statuettes, royal robes, belts, antique coins, and armour suitable for the greatest adventurers of legend. Each treasure has been carefully calculated based on standard values but there is nothing standard about these treasures! Here in a single volume are nearly 700 treasures to use individually or mix into an astronomial number of combinations, more carefully thought out and detailed than any before. Containing treasures suitable for the lowliest of pickpockets and brawlers or the most splendid of kings and queens, this book will augment your imagination and encourage your heroes to ever strive for more opportunities to obtain treasure. Creative flair and painstaking research together provide you with treasure that is as "real" as you can get in a world with dragons and wizards. 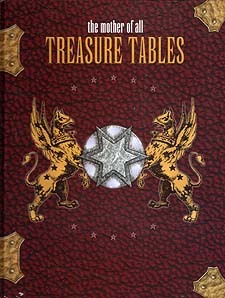 This is the Mother of All Treasure Tables!